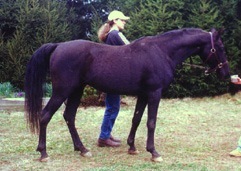 Back in March, I saved from going to auction for a past due board bill, a purebred Arabian black stallion. This poor guy was special because of his bloodlines, the term Al Khamsa, I soon learned, meant he was descended from one of five Arabian mares, "The Chosen Ones," that Mohammed had selected as the best. Small in stature, but sweet and kind, he bore the ravages of having been neglected early in his life - a life that was spent in a stall, pacing, wishing to get out into the light of day. Although the last year before I got him he had been treated well, living in his own paddock with shed, the past had taken its toll on him physically. I personally, with the help of friends, spent 12 man hours painstakingly picking out his mane from the dreadlocks that it had become! I contacted some Al Khamsa breeders to see if there was anyone that would treasure Aatik as he deserved. I also listed him on my own website. I was contacted almost immediately by *Trés de la Force-Khamer of Athens, Georgia. Ms. de la Force-Khamer informed me that she ran an Arabian rescue in Athens, called Athens Area Arabian Rescue Mission and also bred Arabians herself. She was knowledgeable and enthralled with the idea of owning this rare gem of a stallion. She and I agreed to the terms of payment for this horse and she made arrangements to ship him to her farm. A shipper picked Aatik up on April 21, 2002. I didn't have any payment or contract in hand yet, but was assured by Trés that all was in the mail on its way to me. So I released the horse. I will regret the trust I placed in this woman forever. I never received payment (s) or contract. In August, after contacting Trés several times and being told several times that the "check was in the mail," I finally said ENOUGH. I contacted the same shipper and asked them to pick up my horse, I would supply them with the necessary documentation. That's when I learned that I wasn't the ONLY person trying to retrieve a horse from this place. That's when I got busy. And that's when an "Angel From Heaven" came into Aatik's life - actually several ANGELS, all so dedicated to saving him and the other horses in this woman's care, from the awful fate of staying there! Fortunately for Aatik, his suffering is over now. 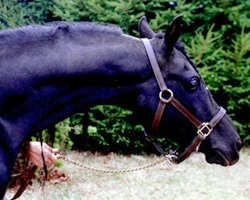 His "Angel" intends to buy him herself and forwarded this photo of him, taken on September 2, 2002, one day after she rescued him. 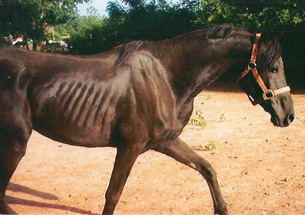 Trés has told everyone that this horse arrived in Georgia looking worse than this. Thanks to everyone who prayed and sent good thoughts through awhitehorse.com and other means. Thanks also to all of the other "Angels" that lent a hand or made a call - my gratitude is unending! We are hopeful that Dancer will soon find herself removed from this situation too! Stay tuned to this page for updates on Aatik and the others still there. We will inform you on who to contact to enact new legislation in the State of Georgia so this never happens to another horse. The Department of Agriculture didn't think this case warranted impounding these animals....even when they admitted Aatik weighed 100 lbs less than this when they first inspected him at this farm. It seems to me that they should be able to step in before an animal is CRITICAL. There is a premature foal and his dam still stuck there...with a poor wire fence around him that he can walk right through and stand out on the road. Dept of Ag can't do anything "until the animal is at large," which in this case, probably means hit by a car and dead on the road. UPDATE: In the weeks after this story was first posted, Trés was evicted from the farm she was renting for non-payment of rent. She disappeared will all of the horses in her charge, including Dancer. In December, I learned that the Dept of Ag had impounded Dancer and another of Trés' horses, as the lady caring for them for Trés could not keep them any longer. Trés was again being evicted from her residence, so was in no position to buy them out of impoundment. Dancer's owner is communicating with the Dept of Ag and stands a very good chance of being reunited with her horse!! Keep your fingers crossed! According to Sherry (aka "Angel"), Aatik is doing very well and is fat and sassy this winter. Hopefully we will have some photos to post soon!